New! 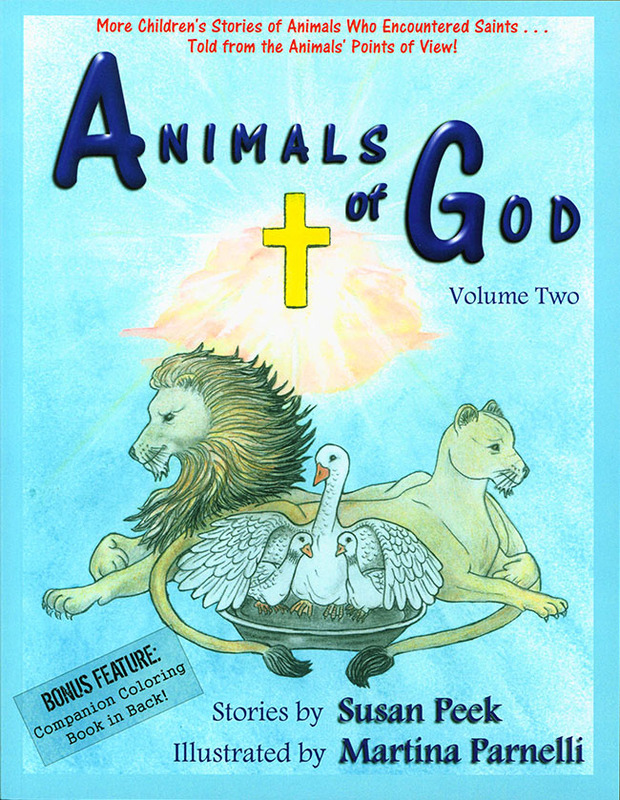 Catholic author Susan Peek is back with two more stories of animals that encountered saints...told by the animals' points of view! Beautifully illustrated with black and white drawings. 8.5 x 11 inches. Soft Cover. 120 pages includes bonus Reproducible Coloring Book in the back! The Lion Who Lost His Appetite Rex the Lion has it made. A bloody persecution is being raged against the Christians of Antioch, and it's Rex's job, along with his wife Leonie the Lioness, to meet'n'eat the helpless prisoners thrown into the Colosseum. Rex can hardly wait! After all, what more could a lion want than a tasty man for breakfast every morning? Sure, he misses his home in the jungle and detests his cage, but the delectable menu makes it well worth it. Then one day a beautiful young lady named Thecla is thrown into the arena to be killed, and things will never be the same for Rex and Leonie again. A delightful tale of a saint's unwavering trust and God's infinite power, told from the lion's point of view! Cuthbert for Breakfast Chester the Gosling would give anything to be like his big brother Cuthbert. Cuthbert has it all – sleek handsome feathers, strong graceful wings, a winning personality, and a whole gaggle of friends. In fact, Cuthbert is the most popular gander around. He and his buddies have all the fun, while poor little Chester with his downy feathers can only paddle around the pond with his best friend Delmer, learning to swim. When Cuthbert and the Goose Gang plan a raid on a cornfield, Chester begs his brother to let him and Delmer come. Little do they know, as they fly off on their first great adventure, that things are about to go terribly wrong. When the geese are captured and his brother killed, Chester knows all is lost. Enter Saint Werburga, the owner of the cornfield, and a breathtaking miracle is performed. An endearing story of brotherly love and God's unfailing mercy, told by the little goose's point of view!